A VA spokeswoman chided U.S. Rep. Mike Coffman on Monday for statements the Aurora Republican made recently in which he imagined the U.S. Department of Veterans Affairs running the terrorist group ISIS. It is hard to find the correct words to explain Congressman Mike Coffman’s sickening remarks on KOA radio this morning, in which he likened the U.S. Veterans Administration to ISIS and joked about beheadings. Coffman was a guest on “Colorado’s Morning News” on 850 KOA this morning, hosted by Steffan Tubbs and April Zesbaugh. 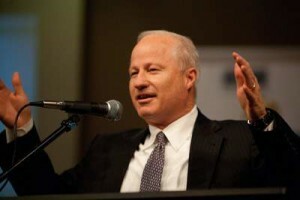 His radio appearance was a chance for Coffman to celebrate another punt from Congress, which will provide construction funding for the Aurora VA Hospital until October — the second short-term funding approval for the VA Hospital in the last month. MIKE COFFMAN: It’s too bad we can’t take VA leadership and export it and give it to some of our adversaries around the planet. Let them suffer under the VA’s leadership. So, clearly we need to clean house. We need better leadership. The President needs to be engaged on this and other issues. APRIL ZESBAUGH: [laughing] He’s on a roll! Of course, Coffman finishes his rant by demanding “better leadership” at the VA and from President Obama. He never explains why voters shouldn’t expect better leadership from him, since he’s supposed to be in charge of OVERSIGHT of the Veteran’s Administration. There is no excuse for this. No defense. Instead of taking a leadership role himself — instead of trying to find a solution to the VA Hospital funding problems — Mike Coffman just continues to blame everybody else while making crude, horribly-inappropriate jokes comparing the United States Veterans Administration to the terrorist group ISIS. Mike Coffman crossed the line this morning — BIG TIME. It would be an absolute disgrace for Colorado if this man is re-elected in 2016. Hey Coffman (and I won't use the honorific of some jerk who sees fit to compare VA employees to ISIS murderers): If you're the freakin' chair of the House VA Oversight Committee, was there even ANY single project bigger than this hospital that the VA was undertaking at the time you were the chair? I mean, wasn't this the biggest project you were supposed to be overseeing? VA employees aren't terrorist murderers. But you, sir, are a grade-A a**hole. Representative Morgan Carroll. I like it. Old Mike = New Mike = No Mike = ?Lobbyist Mike. He is toast in 2016. Unfortunately he's far from toast. Something is seriously wrong with this man. He's got no filter. VA leadership may be incompetent, technologically backward, or even corrupt in some cases. It doesn't make them anything like ISIS terrorists. The vast majority of VA employees who do direct patient care are some of the finest people you would ever want to meet. I expect to deal with them the next time I have to deal with getting my ex-hubby hospitalized, and I expect that they will do the utmost in their power to care for him and all the other vets. You may remember that despite this video he got reelected that year. We're preachin' to the choir here. Understood, BC – Got no parade to rain on. But this "choir" should be working very hard for Morgan Carroll, or whomever Coffman's opponent is, using this video, the "VA=ISIS" audio, and whatever other gaffes he generates between now and November 2016. We can take a page from the Rove playbook and attack Coffman on his strengths, i.e., his appeal as a military man and advocate for veterans, by playing this audio over and over. I can tell you that, as a family member of a veteran and admirer of the VA's work as the largest functional single-payer health entity, it is deeply offensive to veterans and those who care about veterans. Too bad the "we" who will be making these decisions are Dem political ops and they've been very squeamish about using Rovian jiu jitsu against R military men, no matter how regularly they vote against troops and vets in favor of the top .01%, because they're still afraid of the big bad patriotic righties labeling Dems as anti-God and Country terrorist coddling wimps who don't support the troops. Meanwhile, Rs use it without a single pang of guilt against decorated amputee Dems. It's a problem. Andrew Romanoff is probably muttering," I can't believe I lost to this smuck." More like Romanoff's volunteers must be muttering "I can't believe he ran such a lousy campaign against this schmuck." Politics is all about timing. Romanoff is a fine man but you just weren't going to beat an incumbent Republican in an off year. In 2016, when some Democrats will actually stop whining and vote, it could be a very different story. Like the Arapahoe D.A. playing with his phone rather than paying attention to a witness, let's make sure this comment dogs Coffman all the way to November of '16. Especially since it was recorded, so he can't claim he didn't say THAT.